- now using the \dosbox folder in the root directory of the USB drive as the place to copy your DOS games. 1) Get yourself a USB stick that you don't mind formating (get your data off it). The ISO is 400mb, so lets say any usb stick 1gb or larger should be fine. 4) Use Rufus to 'burn' the ISO to your USB stick. Becareful which drive you are selecting. 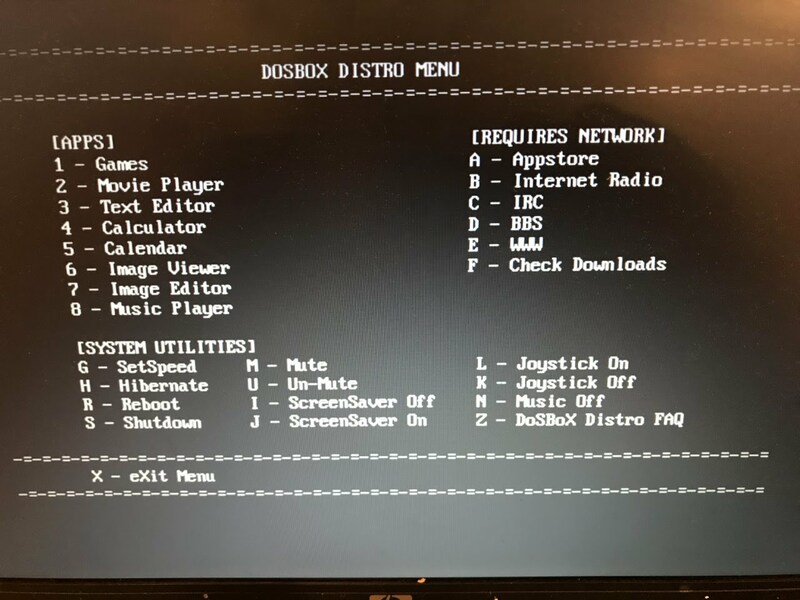 Note the important items - FAT32 filesystem, LABEL must be DOSBOX_BOOT (Linux is using the label to determine drive/path), Burn as ISO, and double check what ISO your burning. 7) If everything went well, your now at a dos prompt! Sorry for the crappy image quality, I hope to do a youtube video demo'ing my latest efforts soon. Let me know what issues you encounter. I'm curious if audio works for everyone. What do you think of performance? Let me know if it didnt work at all. Thanks! Last edited by BinaryDemon on 2018-12-29 @ 08:49, edited 8 times in total. God how i like when custom linux distros or Rasperry PI custom distros are uploaded full image. Not just a novel of text how to configure a linux "that" way. I know that you have to learn, but everything in Linux world is allmost free, so what is stopping you to just upload your HDD/SD image. So i thank you for that! Cyberdyne wrote: God how i like when custom linux distros or Rasperry PI custom distros are uploaded full image. Not just a novel of text how to configure a linux "that" way. It's "almost" a preconfigured full image. Rufus is a very useful tool to format and/or check pendrives or flash cards, but it also can get (most) linux ISO images and convert it to bootable USBs (it even can convert some Microsoft Windows ISOs). There are other tools like unetbootin or yumi that can do the same thing. Just remember: Bootable ISO image + Rufus = Bootable USB. In fact you could forget about Rufus, burn the ISO image and boot it from your CD. Doing it from a pendrive has two advantages: you can put your DOS apps on the pendrive and a pendrive will take more abuse than a CD. I know how to use rufus, and orher same kind of tools to convert isos to SD cards, make bootable SD and USB stuff. No poroblemo. But messing with linux configuration, if someone has done the work, share the image, not start your instruction with some kind of a script that enables linux to automatically go somewhere without asking you to log in And before that you have to compile something custom, and then you have to download 832 different packages and toolkits, and then some more scripts, and then maybe you have something. And maybe you made one mistake along the way, and now it does not work. My only thoughts on posting a direct image is whatever size drive I use, that’s the size the user would be stuck with unless they are comfortable with gparted or another partioning utility. Am I wrong? Image and partition resizing is so easy, if you compare it with linux "messing around". Hello, I signed up on this forum to discuss this. I just downloaded your mini distro tonight and tried it on two different computers. 1 was a Zotac mini all in one PC with a 1.6Ghz Intel Duo CPU and built in Intel graphics. With it, I do not get sound through HDMI or the Audio jacks on the computer, and Fallout plays slower than it does on the same computer booted into Mint and running DosBOX. 2 was a Dell Low Profile system running a Quad Core Intel running at 2.66Ghz and using a Geforce Gt610, though it seems to run Fallout even sllloowweerrr, and I also get no audio through HDMI or through the on board audio. Other than that, I've got my eye on this and am very eager to watch it develop over time! Sorry I didnt see this comment earlier. Thanks for your interest. Tinycore has some issues anytime hdmi audio is thrown into the mix. The speed issue is probably DosBox's default speed of 3000 cycles. Cant remember if I had the setspeed command finished for minimal version, maybe try something like: config +set "cpu cycles=38000". 38000 is my new default, its basically about the fastest a first gen atom cpu can handle. I don't expect people will be installing this on something slower than that. Hope to have a new beta out soon. I updated ISO with a lot of additional features. I hope to make a youtube video soon. And possibly give away some hardware (thin clients) with DosBox Distro installed in a few weeks. Stay tuned! I had a bit of time to play around with this today. I am very much liking the concept especially in its simplicity. 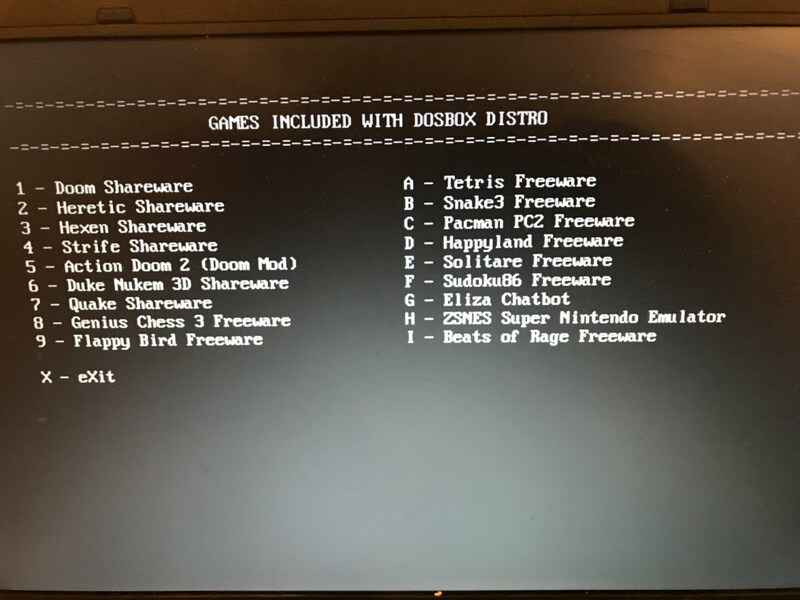 I especially liked the added dos tools that dont usually come preinstalled by dosbox. I also like the preconfigured speed menu to choose from. Everything seemed to work work from what I tell from running dosbox. Also an added plus for the talking menu screens. Very good start for a beta to demonstrate what its uses will be. More configuration would be nice, especially for sound options. Sound is a big one for me, so I think it would be awesome or crucial to have something to handle general midi. Either from sound font loading, or maybe even MUNT built in for MT32. Having this with an easy way to switch between them all would be great. Also including an option for plugging in a usb to external midi to run some midi hardware would be great as well. Thanks for testing and suggestions. What hardware or vm are you testing with now? To support some of those midi options, Pretty sure I would need to get the DOSBox ECE fork or something similar running. Downloaded this morning and tested on 2 laptops. To exit browser, close the tab. Or does that happen and it just doesnt return you to Dosbox? I think I can improve the Sound Compatibility, just need to figure out the best way. I'm pretty sure in many instances it detects the sound devices, but is selecting the wrong one by default. Odd that Strife doesnt work. Doom/Heretic/Hexen/Action2 mod/Strife are all using zdoom. I'm just swapping *wad files around. I'll see if others report that issue. I've tried PuppyLinux before, just not recently.